I am standing at the Prague Vaclav Havel airport with my camera backpack and a 10kg suitcase that I just grabbed off a conveyor belt. My head is spinning. Did it really happen? Was I really in Africa? Did I really see everything with my own eyes? Or was it all just a dream. Surely, all the photos on my cards are a clear proof of me not going mad. It took a whole over an hour-long journey home by a local public bus to recap all that happened. Sometime back in June I was approached by representatives from Olympus Europe, who were on a hunt for a team of photographers that would with Olympus gear create an attractive photographic collection for the upcoming biannual photography trade show – Photokina (26. – 29. 9. 2018). Each of the selected photographers was named for their excellence in specific photographic genre – landscape (Andreas Geh), motorsport (Mike Inkley), wildlife (Petr Bambousek), people (Meeri Koutaniemi), wild birds (Jari Peltomäki) and macro (Frank Rückert). As for myself, I was chosen to photograph wildlife, and the whole experience was to be immortalised by Chris Eyre-Walker on video. This, however, was associated with a week-long trip to Botswana at the end of July. Will I be available? As if I could miss something like that. Even if I were on Mars, I would make myself available. I just could not refuse such an honour. And so I started packing for a trip of a lifetime that I would probably never resolve to by myself. Those that know me have asked me on many occasions, why don’t I go to Africa, that despite my travelling half the world, Africa is still missing from my portfolio. Up to now, my answer was short and straightforward – there are tons of photographs from Africa plus the TV has been inundated by so many documentaries from that part of the world for so many years that I simply feel there are not many chances for me to capture any unique photos that would grab anyone’s attention. Besides, taking photos in Africa entails also one element that I’m somewhat averse to. And that is that most of the time, due to safety reasons, you need to take pictures from a car. Sometimes you can get out of a car, of course, but ideally only if accompanied by your guide. In short, an overused theme and a rather difficult journey to the destination put me off Africa for years. However, when this offer came to me, I simply couldn’t resist. Even now, though, a few days since my return, I must admit it was all rather arduous. Arduous yet equally absolutely thrilling. What you will not find in any of my photos, though, is that feeling of complete humbleness when you stand in a roofless truck face to face with a lion or a leopard that could have you for a snack any minute. The only reason why they don’t attack is that that big metal-ly noisy thing never actually hurt them and you pray it stays that way. Suffice to say, that Africa totally captivated me, mainly probably thanks to our fantastic location. Our stay was entirely organised by a company called Wilderness Safaris that is one of the best in the entire region. Their camps, located in best possible locations, are luxurious and pride themselves on excellent care for their clients. In total honesty, the entire stay was organised at the highest standard. We were pampered day and night. The camp was full of enthusiastic people, that love their work and are willing to solve any issue (such as lost luggage) with a smile, all of which made our stay extremely enjoyable. Unfortunately, the entire stay was very short. Maybe too short, actually. However, having been surrounded by an amazing, perfectly organised team, that was capable of tracking to a tee, I had a feeling that those 4 days, spent in two camps (2 nights in each camp) resulting overall in around 3,5 day of shooting, felt more like 2 weeks. I know that on my 40+ expeditions over the years I have seen more than a fair share of ‘awesomeness’, but this trip was a whole new kettle of fish, for which I’d love to thank all the Wilderness Safaris’ staff as well as all my colleagues from Olympus. The trip was absolutely flawless. 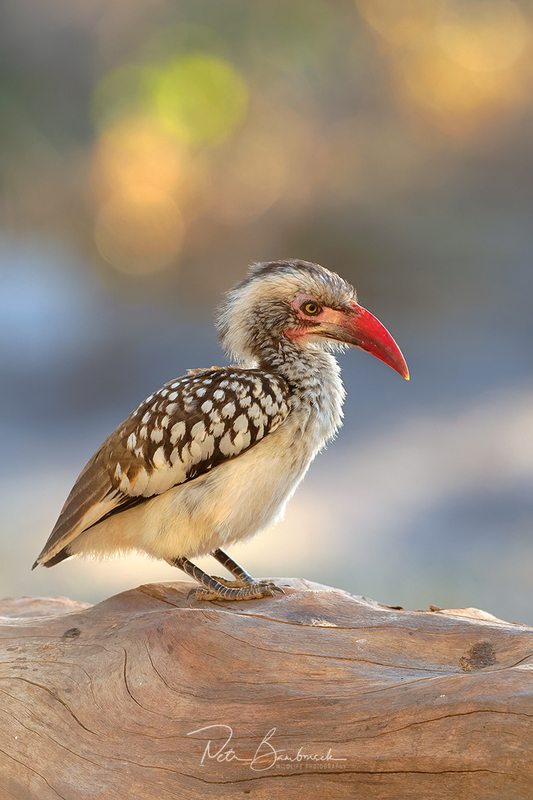 Needless to say, that so was our stay at both of the camps we visited – the Kings Pool at Linyanti and the Mombo camp, Moremi in the Okavango Delta – where I can imagine staying for weeks. I would say that only in the Pantanal have I experienced such an abundant location for photographing wildlife that was amplified by the massive concentration of large African animals. 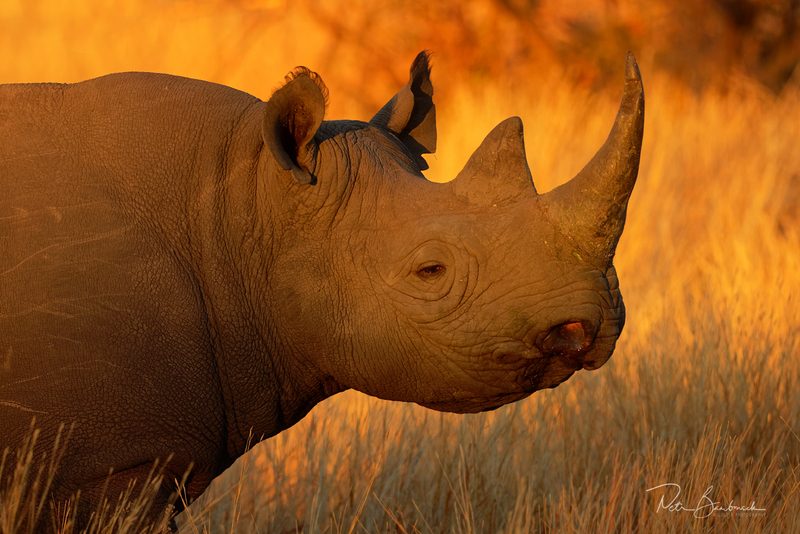 When it comes to Africa, most people are mainly interested in the so-called ‘Big Five’. 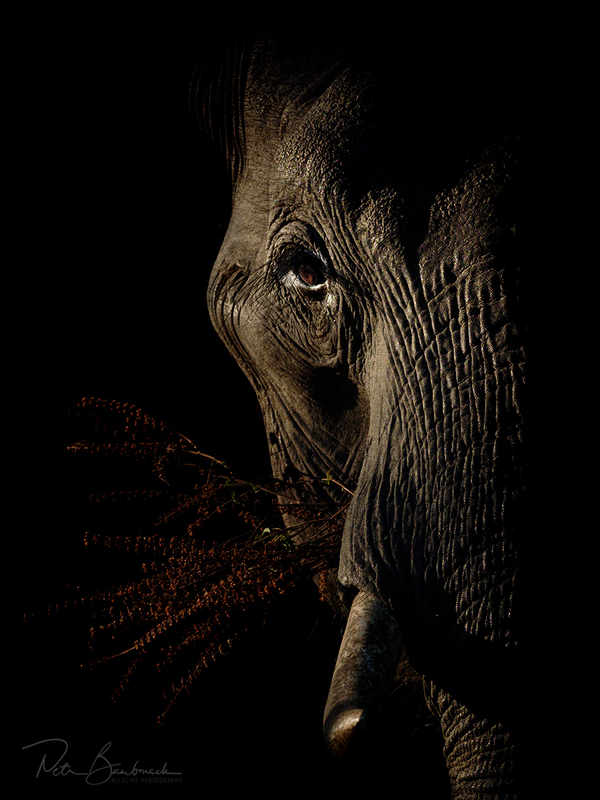 The magnificent African bush elephant, black rhinoceros, African buffalo, lion and leopard. And for some, this is the only reason why they keep coming back. Although, I’ve never even yearned for such a trophy I managed to photograph all of them in under 3 days. As it was pointless to fight it, I approached the project with a free mind knowing that I need to focus on the mammals. 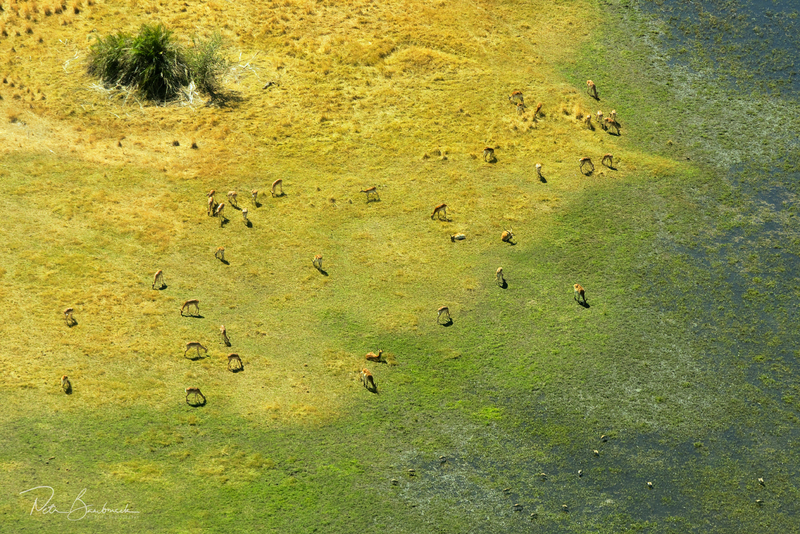 My first mark into the ‘Big Five’ started already on a plane to our first camp when I could distinctly discern several herds of elephants on watery patches in the delta below me. By the time we landed, I already had my first 400 photos. 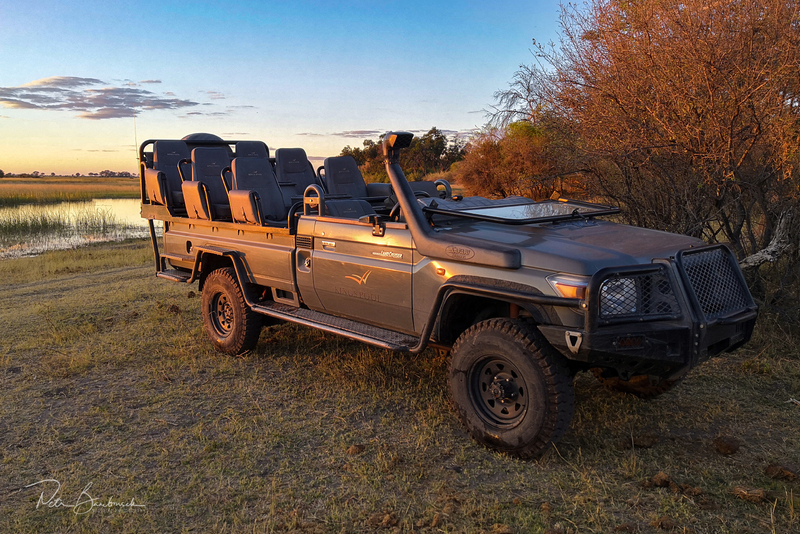 And it continued in the same style on about an hour-long trip from the airport when we saw giraffes, impalas, hunting bee-eaters, an elephant every now and then and even a hippopotamus charging straight in front of our jeep into a waterhole. It was all so astounding that I was secretly wishing for us never to reach our camp. As a matter of fact, I spent the most exciting moments with elephants. 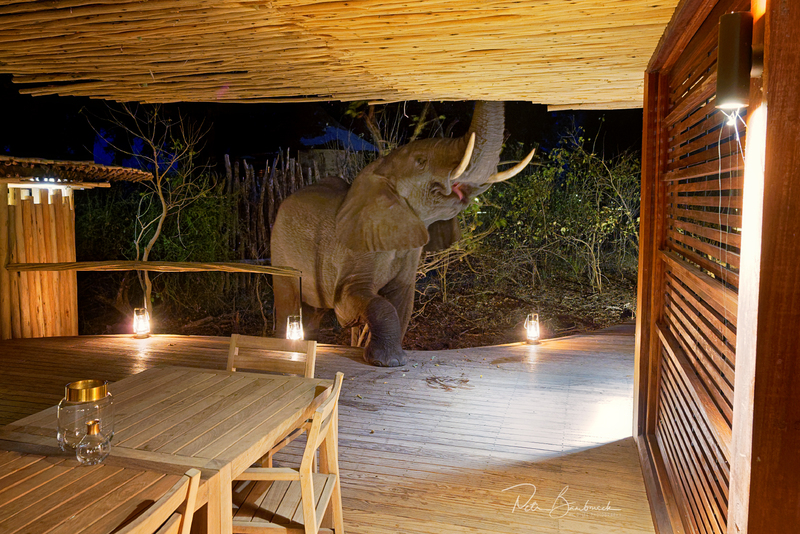 Once, an elephant came straight into our restaurant in Mombo and started to pick fruit from a tree above the roof. Another time, an elephant just casually walked straight through our camp and shook some fruit of a palm tree. While he did that, he gracefully managed to ‘jump’ over a wooden footbridge that was in his way. And on our last night, my own snore managed to wake me up, only to my surprise, it wasn’t me but an elephant that was sleeping under my room. They indeed are incredible animals. We all got to know each other a little bit during our first night in camp, snug around a campfire. 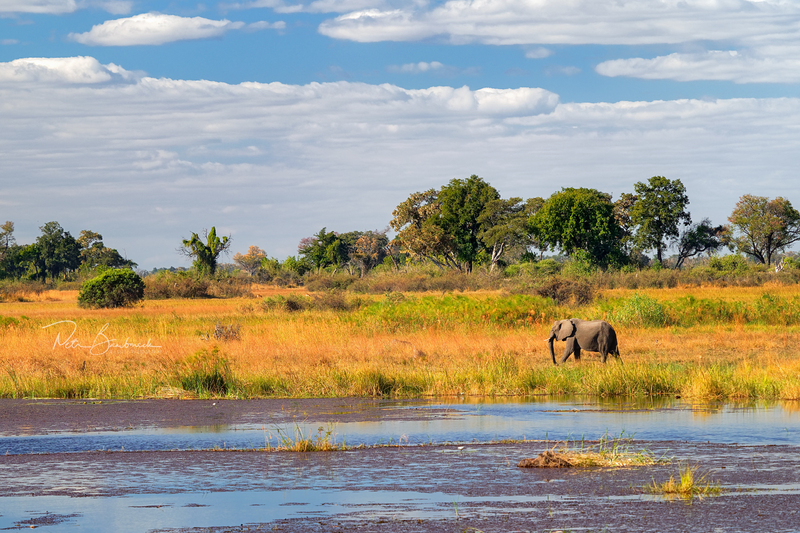 Don’t be fooled, it may be Botswana, but this time of year it can get actually quite chilly. Luckily, thanks to Petr Slavik I was equipped with a warm jacket, hat and even gloves that all came in useful. The following morning, having survived our very first and really cold night, still warmly wrapped up in cosy jackets, we climbed into an open-roof jeep looking for our first animals. Soon after, the trackers discovered fresh leopard paw prints and so it all began. Well, I should probably clarify that when I say ‘jeep’ I mean a civilian version of a militarily armed transporter that not only can go off-road but also can make its own road. It definitely easily replaces local road-management maintained here by the elephants. At first, our hunt seemed to be utterly futile but the jeep stopped all of a sudden and we all saw it. 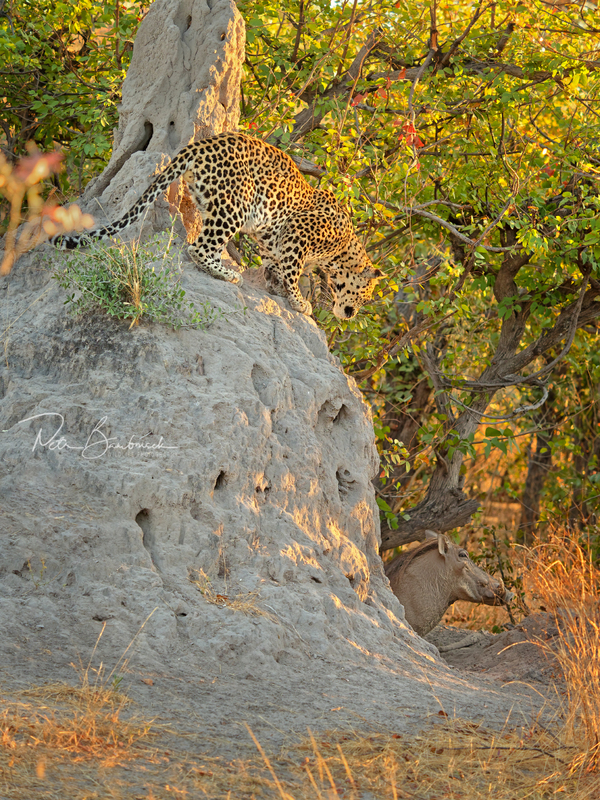 The leopard lied stretched on a termite mound with its back to us and we were all quiet as a mouse, which was totally useless because, as I learnt later, African animals are masters at ignoring jeeps. When the driver decided to move the jeep through the bush to a better location the leopard didn’t even bat an eyelid. He just kept looking somewhere down on the ground. 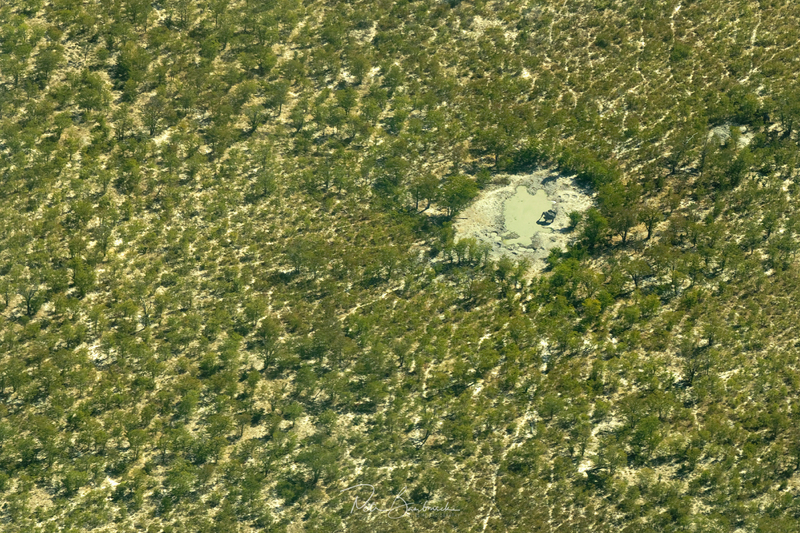 As we all soon found out, a common warthog had a den in the mound. 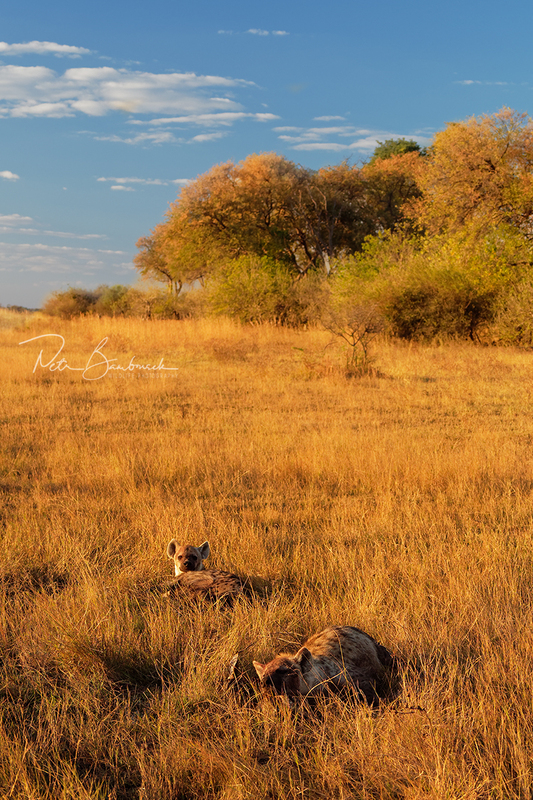 While the leopard was ready to attack at one adult warthog that had his head stuck half-way out, the warthog was full of fear and determination. It all maybe took a minute, perhaps a little more but the warthog decided to charge out of the den. And in the blink of an eye, the prey was gone and the leopard missed it all. There was still quite a lot of dust coming out of the mound opening indicating there might be piglets inside. Leopard decided to wait and so did we. Soon, a hyena came snooping around for something interesting to eat. Leopard got ready to charge, I was prepared to shoot (photographs) and we all waited like this for about three hours. Leopard kept changing his positions and probably even nodded off every now and then before he decided to give in, and with a big yawn strutted off. The piglets won. This time at least. For a while, we tried to follow him but the terrain was way too unpredictable for our truck and our leopard disappeared just as quickly as it appeared. It was all such an incredible experience, little did I know that it was all just a beginning. Our stay in the first camp was mostly spent by filming various interviews for Photokina, which barely left us any time for anything else but a morning and an evening safari. Personally, I found the filming quite hard and so the minutes flew by really quickly. 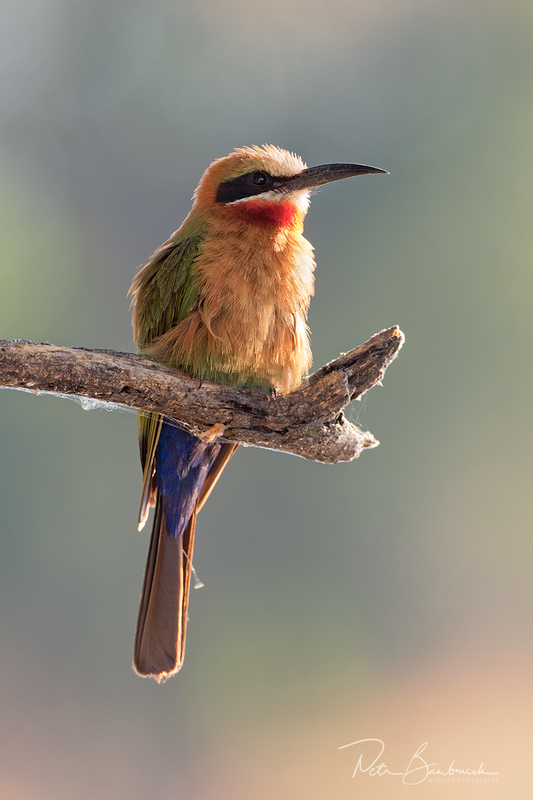 During that time we could see elephants and hippos straight in the camp, and most importantly bee-eaters – right on one of the room balconies. That I couldn’t just let go despite birds not being on my bucket list. 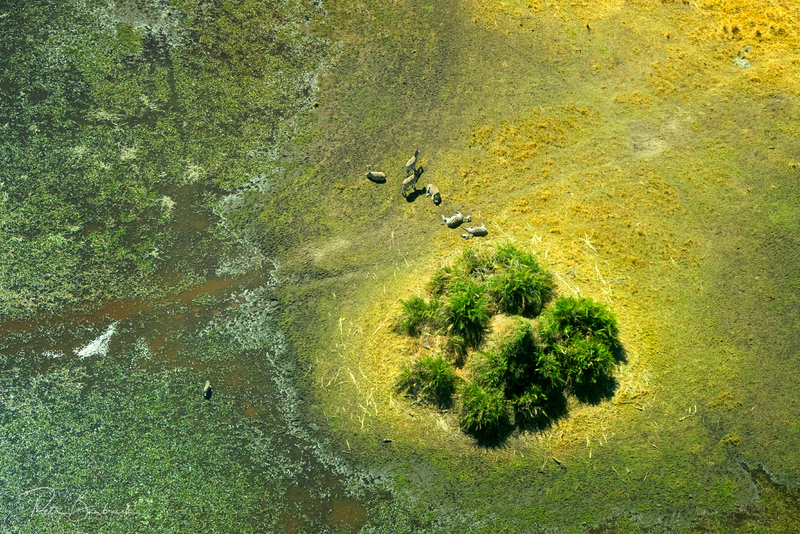 Once we moved into the second camp, Mombo, even an afternoon safari was planned. Here, I must most humbly admit that Mombo is a truly special place that stole my heart away. The nearby wetlands were literally covered by zebras, jumping baboons, scattering stilts, lapwings and herons, you could even see a kingfisher every now and then and impalas had to clear off the road for us. Once I got out on the terrace, the show went on. 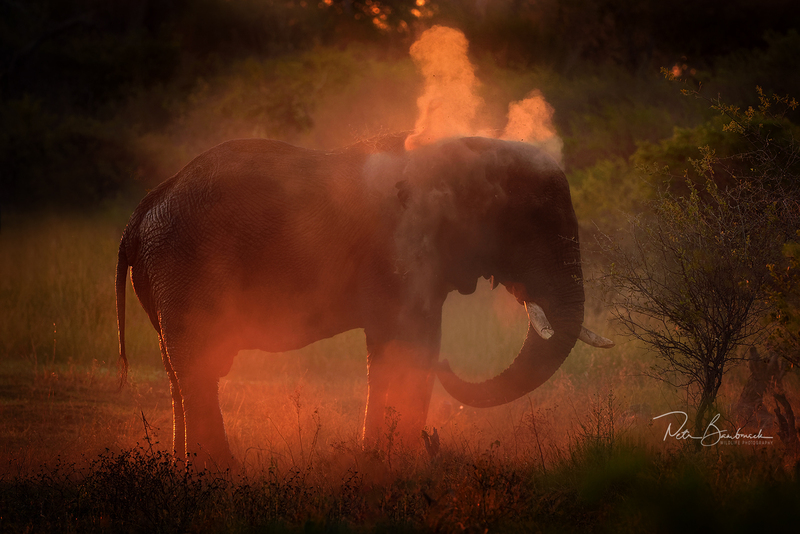 Right in front of the lobby were elephants munching away, sprinting wild pigs and dashing antelopes and more scurrying baboons. I just couldn’t hold my awe in any longer and I literally almost fainted. In the afternoon we were given an option what we’d like to try to see the most. I chose lions. After my encounter with the leopard, I was really longing for seeing the lions up close. Once the truck got into motion, we were passing by small herds of antelopes, zebras and buffalos. Well, they looked ‘small-ish’. At least from a distance, but after the first hundred buffalos, I stopped counting. 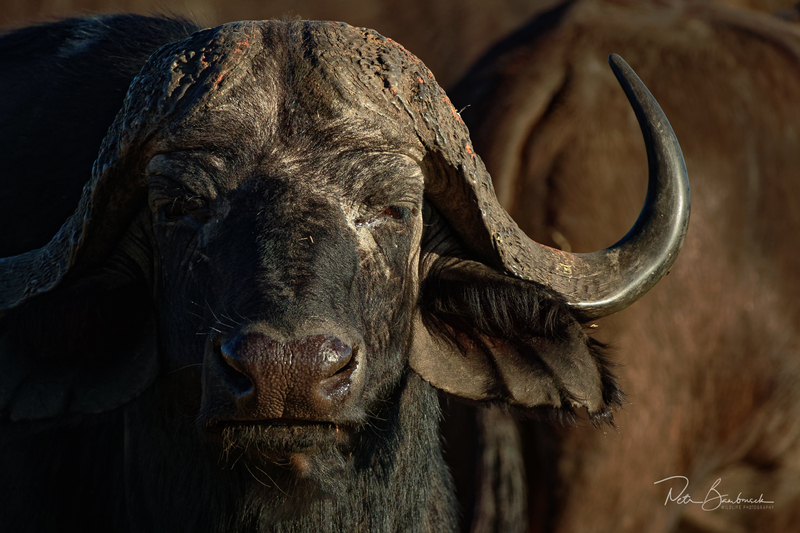 The plains were dotted with several tens, maybe hundreds of peacefully grazing buffalos. Undeterred by the really harsh afternoon sun, I couldn’t resist. After a while, we remembered the lions and off we went. We found them sleeping. They slept for ten minutes. Twenty minutes. An hour. It turns out the lions are really good at sleeping. And soon it was getting dark and we had to return back to camp due to night safety regulations. When it was almost pitch black, different lions crossed our path. First, two young males nonchalantly passed by our truck. 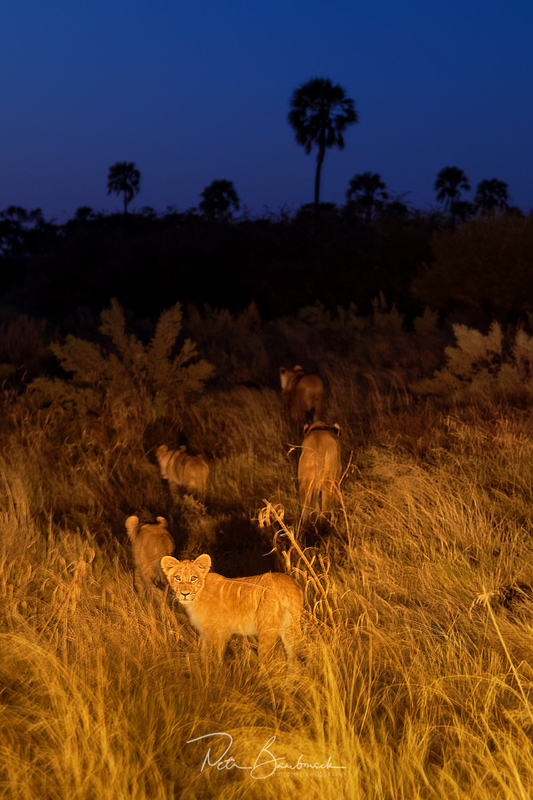 And then, practically in complete darkness, two lionesses with four cubs a few hundred meters further down the road. This concluded another fantastic day. My HD cards were full of several thousand photos and I knew that another day and a half is yet to come. My head was already spinning from all of this that I barely could make sense of. Can tomorrow be any better than this? 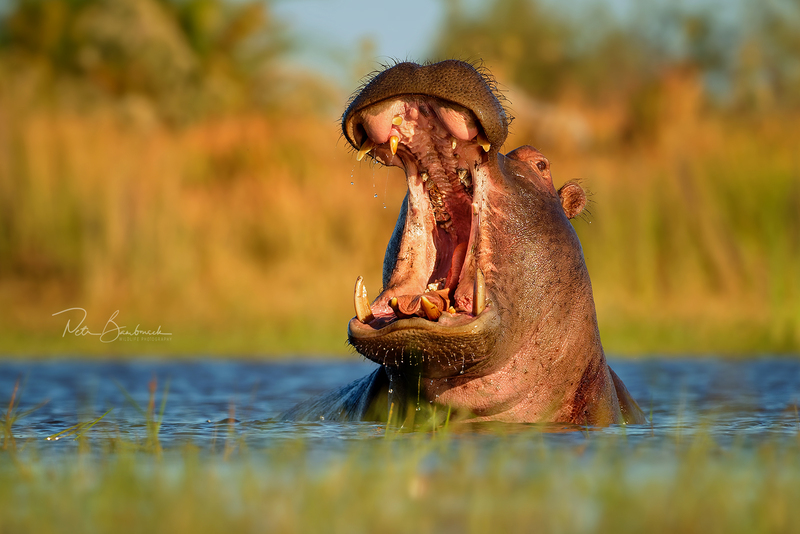 The great hippopotamus may not be among the ‘Big 5’ most iconic African animals, but he definitely is for me. At Kings Pool, there was one that kept serenading to me practically a whole night and so their sound will now stay with me forever. Naturally, the plan for the following day was fairly straightforward – to see the hippos. 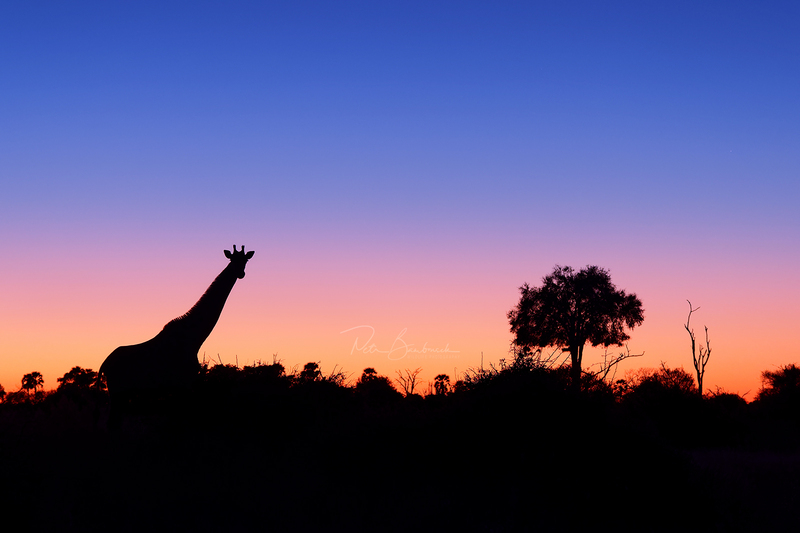 Getting to them took a while though, as we first had to stop to immortalise silhouettes of giraffes against a rising sun, then we visited a rhinoceros’ habitat and then of course actually locating a hippo was like looking for a needle in a haystack despite their enormous size. After loads of back-and-forths, our tracker Ike succeeded at finally finding one. This one, however, unlike all the other animals we saw, didn’t like the truck one little bit and started to run off. We followed him for a while, he tried to scare us with a false charge but in the end, opted to strut away once he saw that nor Ike or the truck would budge. After a while, Ike found the right distance that the hippo was comfortable with and I kindly asked Ike to move us so that I could take some shots of the hippo against a rising morning sun. While Ike was obliging, the hippo not so much. In the end, just before we started heading off to a nearby lake with rhinos, I was pleased with a few decent shots of this magnificent beast. 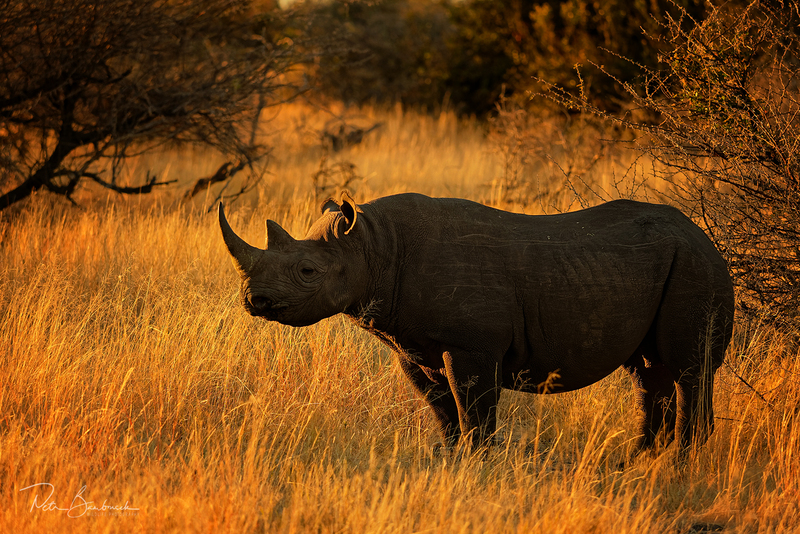 By the time we caught up with the rhinos, the sun was relatively high but still relatively soft. The truck stopped in front of approximately 15 hippos and because Ike agreed to my request to leave the safety of our jeep, we grabbed our cameras and headed for the lake. Naturally, I’m aware of how dangerous the hippos are, it’s not by accident they have claimed so many human lives. Understandably, I lent my life to the hands of our guide. I was there for the first time, not him. 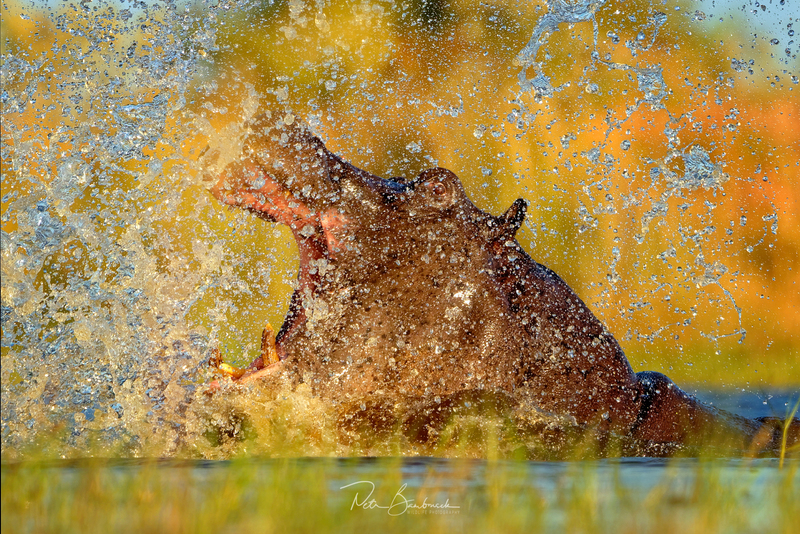 And so when one hippo came uncomfortably too close for my liking, which looked suspicious even in my viewfinder, I asked him up front – “are we running”? His reply “Not yet, but get ready!” calmed me down and I continued shooting. The hippo backed off again and for a good hour, we all admired their raw beauty. Personally, I would definitely include them in the ‘Big Six’. The day barely began and we already photographed practically everything we wanted. 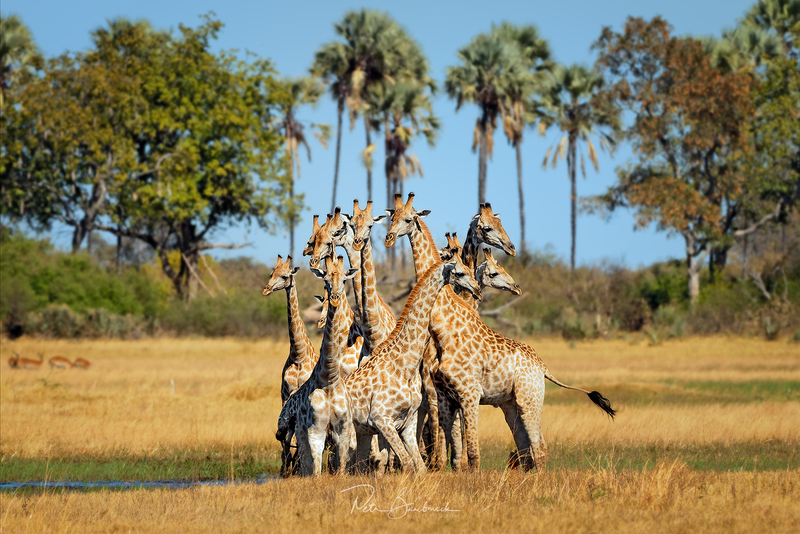 On our return to the camp, I sneaked in a few more photos of giraffes that I just couldn’t resist, we were pleasantly surprised by a lovely picnic by the water that was being enjoyed by elephants, a kingfisher, hornbills and even a hoopoe. 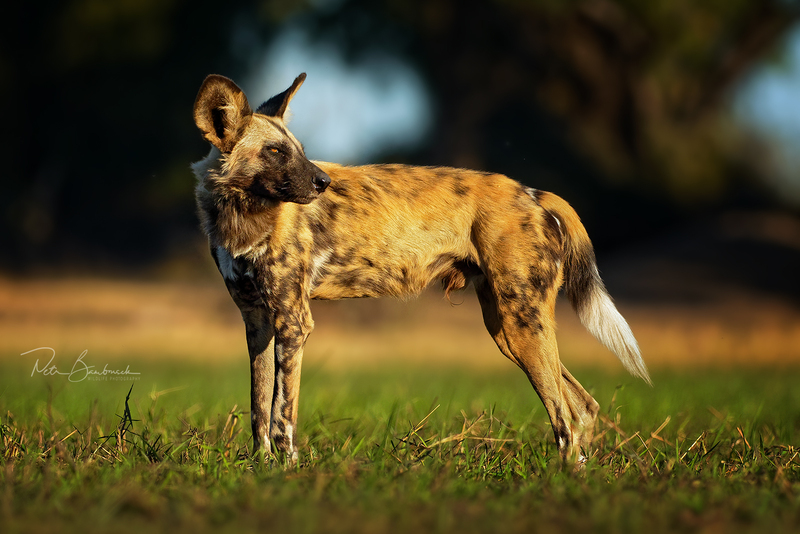 In the afternoon, we were tipped off that there is a pack of wild dogs nearby. Probably the same ones that killed an impala in our camp the night before and had it stolen by hyenas. The moon was almost full which shifted the dogs’ activeness to late afternoon and early evening. We squeezed as much power as possible into all our batteries by charging them for one hour that we could spare and off we went to the dogs. It wasn’t by accident they were called devil’s dogs. They may not look it, but they are really bloodthirsty. Their prey, which they tear into shreds in minutes, stands no chance against their relentless running. Cooperation is indeed one of their most remarkable traits. We found them sound asleep near Alex’s truck who was videoing them all day for National Geographic. About an hour later, the dogs woke up with a big yawn and welcomed each other before charging at nearby sleepy hyenas to retaliate for yesterday’s con. Throughout our days here, our jeep always moved fairly slowly and steadily, which is why a command our guide gave us “Fasten your seatbelts, everyone”, came as a shock. “Once they choose their prey, be ready for a ride” he followed and he couldn’t be more right. First, the dogs would gather by an edge of a lagoon eyeing roaming impalas attentively. Then, all of a sudden, they would charge in like a single body. Ike hit the gas and at full throttle, we were trying to keep up with the dogs chasing after the Impala. Here are some pics from the chase that I think pretty well sum up the madness of the whole scene. Throughout it all, I couldn’t help but hear the music from Mad Max (listen), which perfectly accentuates what was happening. Like lightning, we followed the dogs past a bend, where we picnicked earlier that afternoon. The dogs had stopped and Alex, through a walkie-talkie, told us that Impala ended up in the water eaten by a crocodile. The hunt was on again. The afternoon light was stunning and I was praying for a few more shots despite an unpleasant feeling that my back requires some careful reassembling, which I painfully attempted on the seat. The dogs tried again, but this time on zebras. 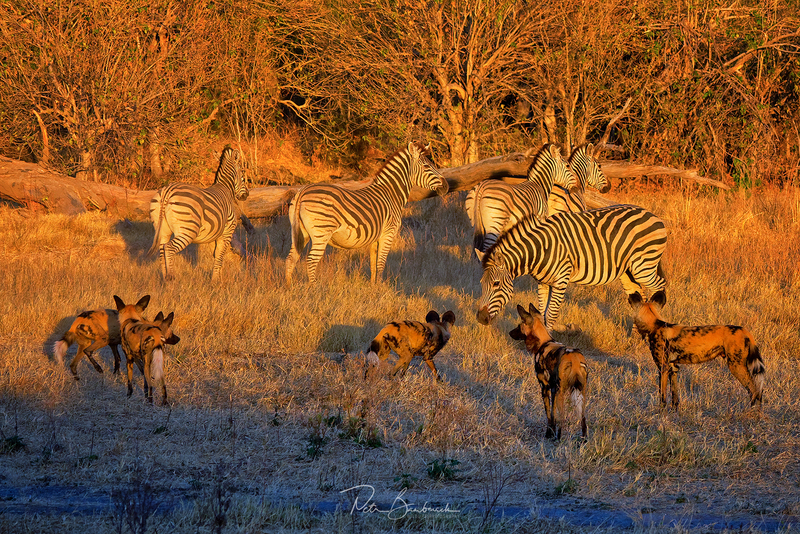 Zebras, however, were not ready to give in and so the dogs left. The whole pack moved behind a small grove. Ike guessed correctly that they are moving closer to their favourite spot – our camp. They sprinted ahead, it was as if the music from Mad Max started again and the ride began. We flew after them exactly where Ike anticipated as fast as we could. I was never so grateful for seatbelts. Suddenly, the pack split in two. We made a u-turn and headed straight for the camp. But we were late. By the time we got there, the sun had set and it was almost dark so we could barely see that the dogs were devouring something with horns. 15 minutes later and all was quiet. With full bellies, leaving bare scraps to the hyenas, they all scattered themselves off into the dark. Wow, that was something! Utterly sensational, breathtaking spectacle and experience that I’ll never forget. On the last morning, I wanted to just wander about our camp and photograph all the little creatures that roamed there each day. 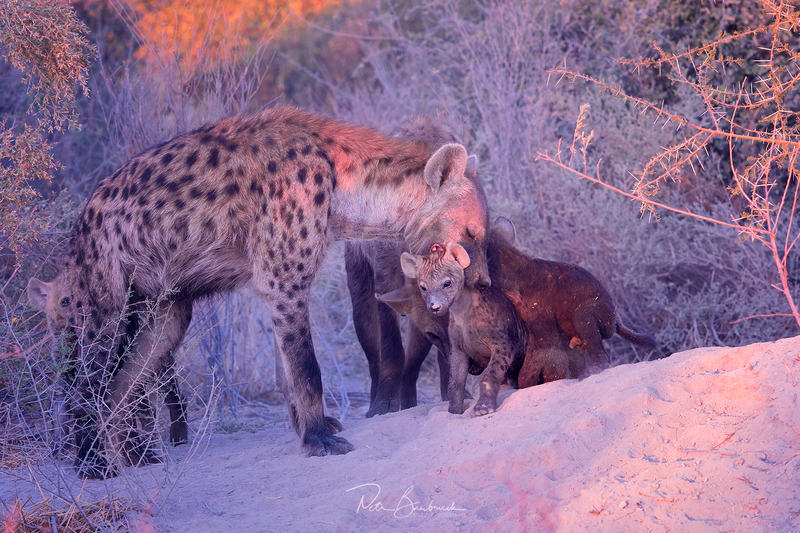 Surprisingly, not much was happening during the first rays of light and so we left to find hyenas with their cubs, instead. I must say, I completely changed my opinion about them once I saw how gentle they were with their cubs. Every time we would see them, they would pursue a much larger predator trying to steal their prey in a way only unique to them. After that, I could actually see them as very kind and sensitive animals. Well, this concludes my four days in Africa. After a short flight transfer to Maun and then to Johannesburg I was on my long flight back to Europe when I could finally have a proper sleep. When in Prague, I collected my luggage and waited for a bus that would take me back to reality. I know this feeling will eventually dissipate, but even after a week I still feel like I’m dreaming. 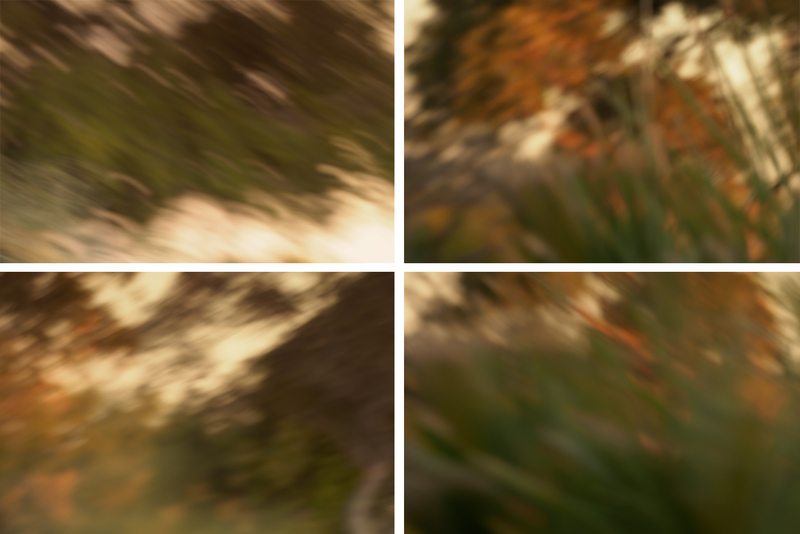 You will be able to see the entire Olympus project at the upcoming Photokina expo in Germany. If you are planning on going, you never know, we may see each other there. You can also look at my photos from the trip to Botswana in my online gallery on 500px, Facebook profile ‘sulasulacom’ or my Instagram. So how is it with Africa and me and my feeling that going there is not the right thing? Well, I know, that what I experienced was creme de la creme, which enabled me to see what others might encounter in weeks. I am aware of the fact that it’s gonna be hard to beat this and that next time there may not be as many animals as this time. However, I can sense massive potential as I largely ignored all the birds that were absolutely everywhere. 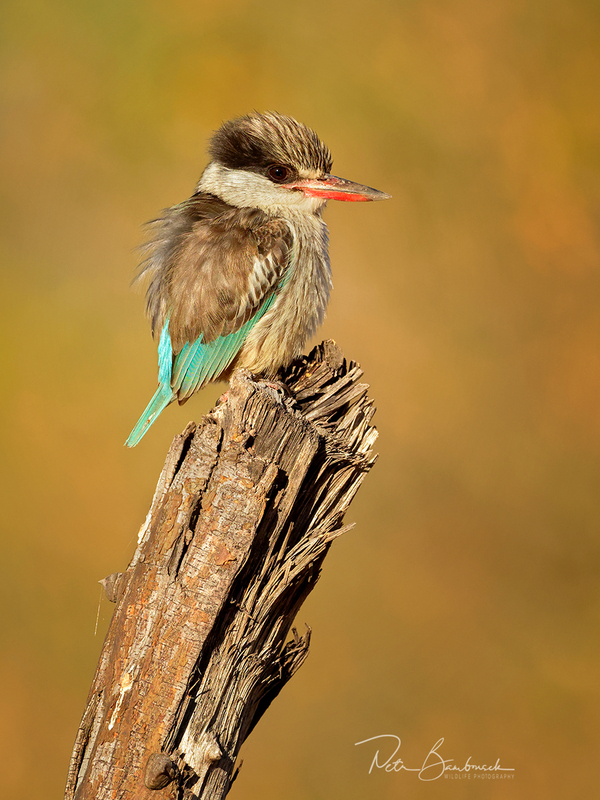 Kingfishers, bee-eaters, starlings, hornbills and many many others. Their numbers are so abundant that it is hard to stay away for long. For that, I know that Africa will see me at least one more time. I am sure of it. I would love to hereby extend my huge thanks to Czech and European representatives from Olympus for an unforgettable opportunity and experience of a lifetime. My thanks also go to all the staff at Wilderness Safaris who organised the whole trip and who was an immense help in reaching our goals. And lastly, thanks to two amazing people that I met on this trip – Chris and Meeri. I miss you already and I sincerely hope we meet again soon. 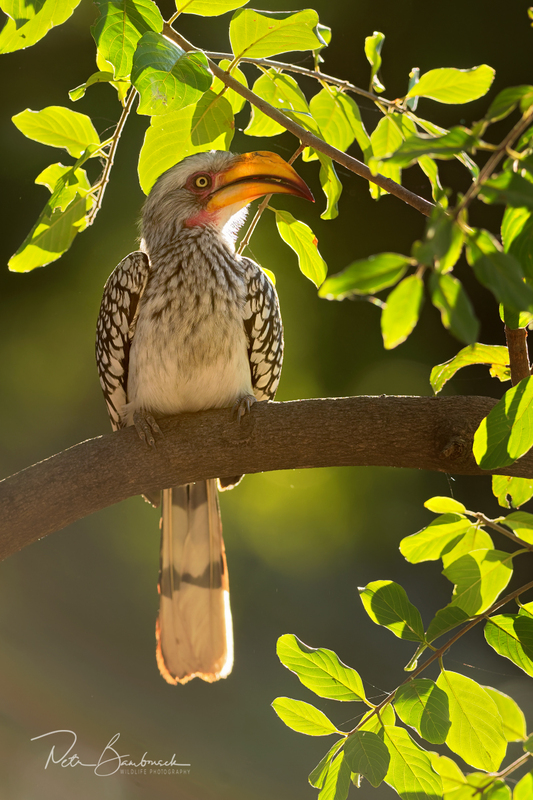 All the above animal photographs were taken with Olympus during a 4-day stay at camps Kings pool and Mombo run by Wilderness Safaris. 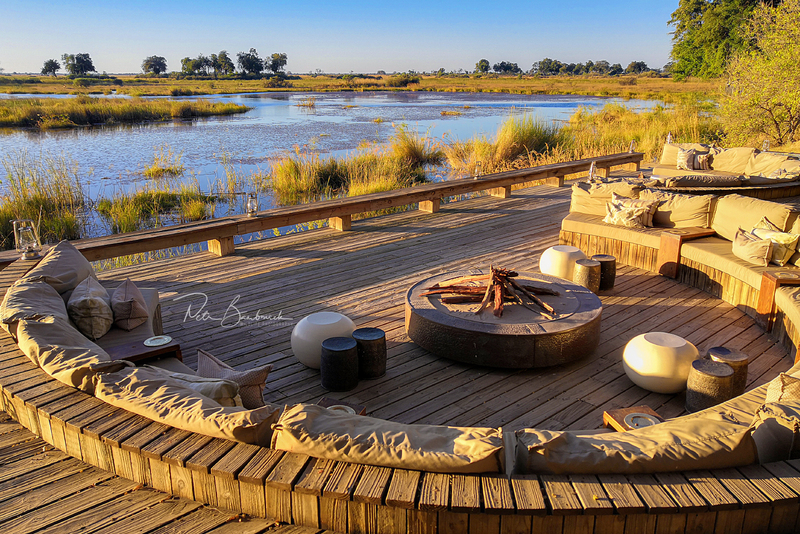 Botswana is really best of Africa. I’ve been there twice, and three times in Tanzania. Always want to go back. Wow, really impressive write up. Thanks for sharing. 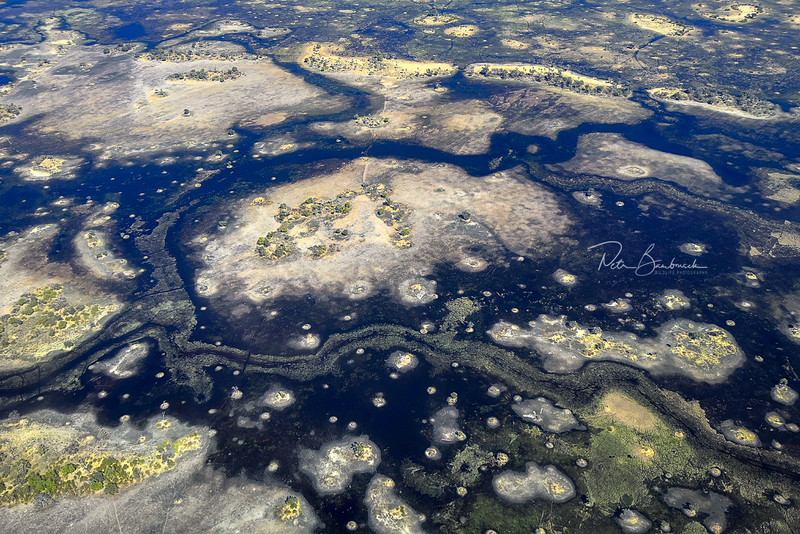 I’ve had the pleasure of visiting the same part of the Okavango also with my Olympus system. I’d love to meet you at Photokina if you’re planning to be there. Really impressive photos. Congrats! 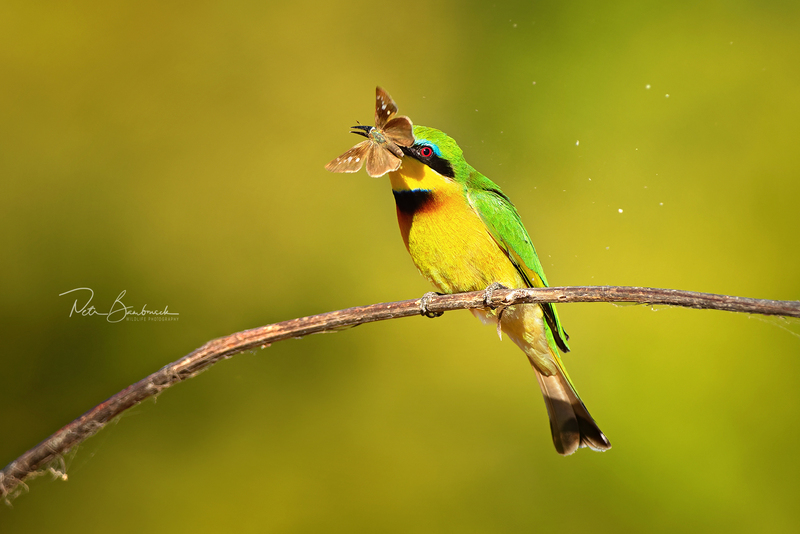 Beautifully taken photos in their natural habitat.